A beautiful Celtic Cross made in 10 Karat Gold, supplied with an 18 inch 10 Karat Gold chain. A perf..
A Celtic Cross made from solid 10 Karat Gold. A perfect gift for a new baby, for a child or for some..
A beautiful Children of Lir Pendant made from Sterling Silver which comemorates the ancient Ir..
Connemara Marble 3 Bead Celtic Pendant with silver chain. A great piece of jewellery. The beads meas..
Connemara Marble 3 Bead Pendant with silver chain. A great piece of jewellery. The beads measure 10m..
Connemara Marble 3 Bead Pendant with silver chain. A great piece of jewellery. The oval beads measur..
A beautiful Irish Celtic Cross charm made in 10 Karat Gold, supplied without chain. A great gift for..
A beautiful Celtic Love Knot pendant charm made in 10 Karat Gold, supplied without chain. 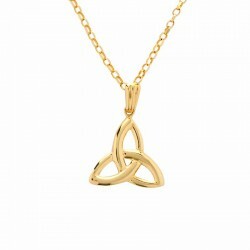 A great gi..
An Irish Gold Trinity Knot Pendant made by Fado Jewelry in Wicklow. The piece measures 15mm x 15mm (..
A beautiful Triskelle or Triskel pendant charm made in 10 Karat Gold, supplied without chain. A grea..
A Trinity Knot Pendant made from solid Sterling Silver. A perfect gift for a new baby, for a child o..
Lovely Silver Celtic Cross with Connemara Marble inlay. The Celtic Cross Design goes back to the 8th..
Lovely Silver Celtic Cross with Connemara Marble and Marcasite. The Celtic Cross Design goes back to..
Silver Celtic Knot Pendant with Connemara Marble inlay - the intertwining knots are an ancient..
Silver Celtic Knots Pendant with Connemara Marble inlay - the intertwining knots are an ancien..
Silver Celtic Pendant with Connemara Marble inlay - the intertwining knots are an ancient symb.. Plain Silver Cross with Connemara Marble inlay. Made from Sterling Silver and inlaid with marble fro..
Silver Harp Pendant with Connemara Marble inlay - the Harp is the official symbol of Ireland -.. Here in Ireland we are immensely proud of our origins and identify strongly with our ho.. Here is a SIlver Pendant Map of Galway. In Ireland we are immensely proud of our origins and..
Silver Shamrock Circle Pendant with Connemara Marble inlay - the Shamrock harks back to the ti..
Silver Shamrock Large Pendant with Connemara Marble inlay - the Shamrock harks back to the tim..
Silver Shamrock Pendant with Connemara Marble inlay - the Shamrock harks back to the time of S..
Silver Teardrop Pendant with Connemara Marble inlay - a beautiful simple design that is truly timele..
A Silver Trinity Knot Pendant made from solid Sterling Silver. The piece measures 1mm x 15mm (2/3 x ..
Silver Trinity Knot Pendant with Connemara Marble inlay - the intertwining knots are an ancien..
Silver Trinity Knots Pendant with Connemara Marble inlay - the intertwining knots are an ancie..
A beautiful piece of Irish Jewellery. The Claddagh Symbol of Heart, Hands and Crown represents..
A beautiful Gold Claddagh Pendant made in solid 10 Karat Gold. It is matched with an 18 inch Gold Ch..
Beautiful Irish Silver Claddagh Pendant made from Sterling Silver. It measures 15mm x 15mm and comes..
Gold or Silver Irish Pendants - Claddagh Necklaces, Trinity Knot Chains, Shamrock Pendants are among the favourites.